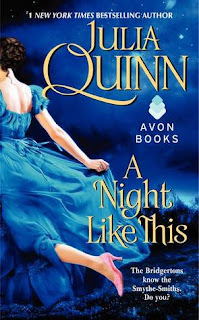 I adore Julia Quinn and I was totally psyched to jump into one of her backlist books that I somehow missed along the way. And at first, I thought I was going to love it. It had all of the light charm and wit I have come to love from this author. On top of that, the heroine is smart and likable, and I thought I could really get behind the romance. After all, the hero saw something special in her that no one else ever has. Sure he has a secret, but how bad could it be, right? This was my first Julia Quinn book. I found it delightful and fantastic and I can’t wait for a chance to jump into her backlist to catch up on all that I have been missing. The heroine of our story is Anne. She was born a gentlewoman, but a horrible event in her past cast her out from her family. Now she makes her way as a governess. It’s been years since she’s even entertained the idea of love. After all, her romantic notions are what got her into trouble in the first place. But from the moment she catches Daniel’s eye across a crowded room, her fate is sealed. A relationship between Daniel and Anne is wholly inappropriate. He is an earl and she is governess to his young cousins. But he, too, has been cut off from his family. A bungled duel put him under a death threat that forced him from the country for years. He has only just returned to the fold. And Anne has made his homecoming even sweeter. Anne knows they can never have a real future, so she fights her feelings. But Daniel is relentless in his pursuit. He is so charming and determined to win her. The evolution of their relationship is sweet and believable. And when someone starts making attempts on their lives, it ups the stakes. Is it someone from Daniel’s past or is Anne’s old life coming back to haunt her? The pacing is so good, the book felt like it just flew by. It had a steady rhythm of romance and action and light-hearted fun. The love story sets the main stage, but the book is made richer with a developed cast of secondary characters, from the trio of girls Anne cares for, to Hugh –the man Daniel shot all those years ago. I was engaged from the first page to the last. It wasn’t even until I was finished that I realized this is the second book in the Smith-Smyth Quartet series. This works completely as a standalone –though I am happy to know there are more books to come.